Nearly two weeks after Hurricane Maria made landfall in Puerto Rico as a category 4 storm, officials estimate just 5 percent of the island has electricity. Adding insult to injury, the New York Times reported the deadly winds and rain ravaged the commonwealth’s agriculture, meaning it could be a year or more before Puerto Rico is once again able to produce its own food. 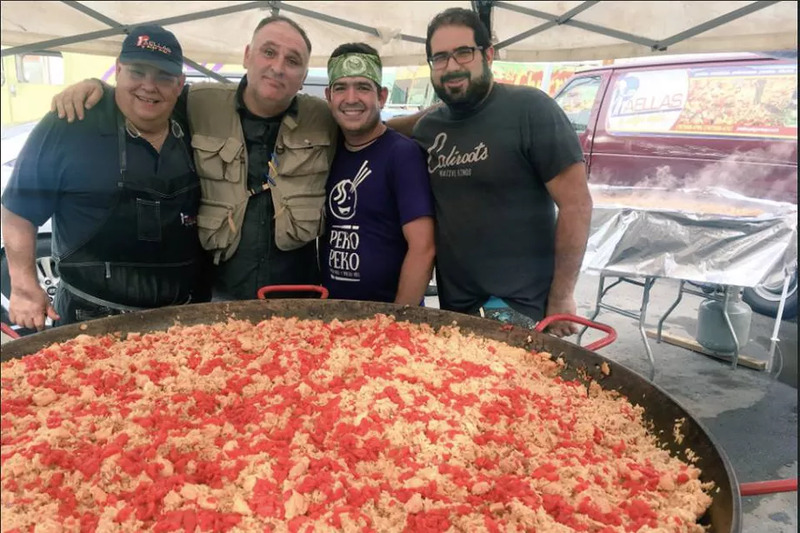 In an effort to ensure first responders, medical professionals, and residents beginning to rebuild are properly fed, famed chef José Andrés has set up shop in Puerto Rico, quite literally catering to thousands of people a day both in and out of the major cities. According to Eater, Andrés, who is documenting his trip on social media, and his nonprofit World Central Kitchen were in the town of El Tuque near Ponce over the weekend, where the community has been living with no water or generators. In a video update on Sunday, the chef announced that he is establishing a kitchen in the area to serve 10,000 meals a day for at least the next week. The El Tuque meals come in addition to the 15,000 plus he and his team have already served on other parts of the island. They handed out 13,000 meals on Saturday in San Juan, before delivering 1,000 meals in Cataño and 2,000 in Ponce on Sunday. While the scale and speed with which Andrés and his team have been able to mobilize resources and distribute food is remarkable, the Washington D.C.-based chef, who became a naturalized U.S. citizen in 2013, admitted it hasn’t all been smooth sailing. Andrés’ mission in Puerto Rico comes on the heels of his time spent in Houston in the aftermath of Hurricane Harvey, where he coordinated with the American Red Cross to feed 20,000 victims and deliver 40,000 pounds of food to the flood-damaged city, and his work in Haiti after the 2010 earthquake. It was that experience that led him to start his World Central Kitchen charity. In Puerto Rico, the Washington Post reports that Andrés has teamed up with local chef José Enrique, whose San Juan restaurant has become ground zero for meal prep. Additionally, food trucks on the island have become a key part of the distribution effort, delivering traditional prepared foods like stews, paella, and pastelon (a Puerto Rican lasagna) to hospitals, senior homes, and neighborhoods. While Andrés was scheduled to have already returned to the U.S. mainland, he told the Washington Post he extended his stay because there is too much work to be done.